It is only March, and there are already some notable suspensions for next fall’s football season, most recently with Oregon quarterback, Jeremiah Massoli, who just pled guilty to a misdemeanor burglary charge from his involvement in an alledged theft on Oregon’s campus. Masoli is not the first player to throw away a promising season (and perhaps, a career), due to horrible judgment and lack of character. In this edition of College FootBlog, we take a look at our College Football All-Suspension Team, comprised of unbelievably talented players who have cost themselves prestigious awards and, in a few cases, cost them a lot of money from the NFL, due to character issues. This week, we focus on the offensive side of the ball, with the defensive members of this exclusive club. Quarterback: Rhett Bomar (Oklahoma): Bomar, who was one of the most highly touted players in the country coming out of high school, edged out Masoli, mainly due to his potential and hype. The former Sooner burst onto the college football map when he took became the starter in his freshman season. He never made it to his sophomore season for the Sooners because of his employment at a local car dealership, in which he and another OU player were paid as full-time employees, despite actually working there. It was estimated that Bomar really only worked 5-10 hours a week to earn his 40-hour a week paycheck. He transferred to Sam Houston State, costing him huge national exposure and the opportunity to be up for all the major awards in college football. 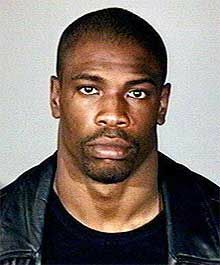 These days, Lawrence Phillips' mug shot is seen more often than his action photos from college and the NFL (google images). Running Back: Lawrence Phillips (Nebraska): We have quite a few players to choose from at this position, but Phillips alledged crime and his fall from grace ultimately won out. Phillips was on top of the college football world as he led Tom Osborne’s Husker squad in 1995. Amid allegations of assault of his ex-girlfriend, Phillips was suspended by Osborn during that season, knocking him out of Heisman contention. 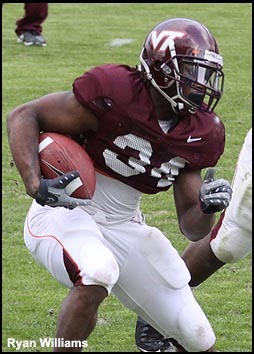 Osborne lifted the suspension and ultimately named him the starter at RB just before the National Championship game against Florida, where Phillips rushed for 165 yards and 2 touchdowns. Osborn’s not-so-hard stance was vastly criticized and despite being a first round pick by the St. Louis Rams, Phillips never managed to stay out of trouble and is now serving a 31-year sentence for assaulting his girlfriend and running his car into three teenagers. Wide Receiver: Peter Warrick (Florida State): Going into his senior season, Warrick was widely known as the best player in all of college football. A shopping spree at Dillard’s in which Warrick and teammate and current NFL WR Laveranues Coles purchased $421 in clothes for $21. He was suspended two games after pleading down to a misdemeanor, but the negative publicity likely cost him the Heisman. Although he was selected fourth overall in the 2000 NFL Draft, Warrick’s talents never really translated to the NFL, and critics questioned his work ethic. Offensive Lineman: Andre Smith (Alabama): Although the former Alabama O-lineman was selected a First Team All-American and won the Outland Trophy in 2008, his dealings with an agent surfaced in December of that year, prompting his suspension from the 2009 Sugar Bowl. His Crimson Tide teammates were upset that season by the Utah Utes. 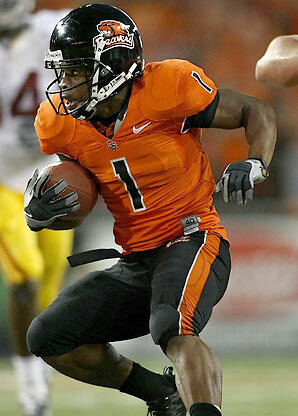 Smith recovered nicely, however, and was a first round NFL selection and currently starts for the Cincinnati Bengals. 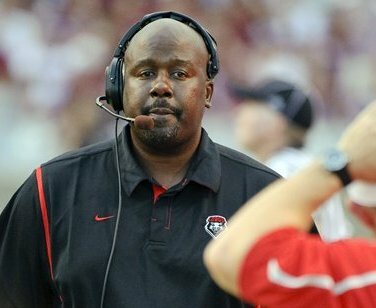 Head Coach: Mike Locksley (New Mexico): An argument could have been made for a number of coaches, most of which are now unemployed, but Locksley has made effective use in his short time in Albuquerque. Since his arrival last season, Locksley has managed an age and sexual discrimination lawsuit (which was subsequently dropped), and last fall, he punched one of his assistant coaches in the face for saying “whatever” to him, which prompted a 10-day suspension without pay. Amid the controversy, Locksley led New Mexico to a 2009 record of 1-11. The good news for the Lobos? Assistant coaches have been seen this spring with reinforced boxing headgear and mouthpieces, so their cut man should be able to focus more on the players. Check College FootBlog next week to see which intellectuals qualify for our defensive unit on this classy squad. With the 2009 football season now officially in the books, College FootBlog will tackle the ongoing debate of which conference is the best in the FBS. In this three-part breakdown, we will rank the six major conferences from the BCS in 2009, and we will also provide an outlook for each conference for the 2010 season. In our first of three articles, we will take a look at teams five and six in the power rankings of the major BCS conferences, although it should be noted that Boise State and TCU could make us rank eight conferences at the conclusion of next season. 2009 Recap: For the last several years, USC has brought respect to the conference, but last year’s fall from grace left put the pressure on the other teams in the conference to step up. No one else did–at least not consistently. The Pac 10 was a dismal 2-5 in bowls last season and one of those wins was USC’s victory over a very mediocre Boston College team in the Emerald Bowl. Losing three linebackers and quarterback Mark Sanchez in the first day of the NFL Draft last season proved to be too much for Pete Carroll to overcome. After a promising start, Cal fell far below expectations, and Oregon started and finished with huge losses on national television. Toby Gerhart led the Stanford Cardinal on the college football map, but overall, the Pac 10’s 2-5 bowl record was very underwhelming. 2010 Outlook: All signs point to the Pac 10 having a big turnaround next season. Conference Champ Oregon returns quarterback Jeremiah Masoli and running back LaMichael James. Oregon State will have the Rodgers brothers returning key running backs coming back next year, Arizona is emerging after an 8-5 record, and Jim Harbaugh and Steve Sarkisian have Stanford and Washington out of the cellar of college football. second year in a row, the Atlantic Coast Conference was consistently inconsistent. Paul Johnson once again proved to critics that the triple option can (and does) work in major college football, but they could not get things going against Iowa’s defense in the Orange Bowl. Virginia Tech racked up ten wins, but once again, Frank Beamer was unable to get his team over the hump as one of college football’s elite teams. For what seems like the fifth straight year, Clemson failed to live up to all of the hype as well, losing five games, including one against a very average South Carolina team. Overall, ACC teams finished with a 3-4 bowl record in ’09. 2010 Outlook: Like the Pac 10, the ACC should make significant strides in 2010. Georgia Tech may take a step back with Jonathan Dwyer departing to the NFL, but several teams should be much improved. Virginia Tech returns running back Ryan Williams and QB Tyrod Taylor, and we may actually see Miami and Florida State get back on the map. Each of the traditional power houses from Florida showed signs that they may be on the cusp of regaining greatness, but they were up and down for much of the season. Look for Miami and FSU to make a serious run at Va Tech next season. Note: Look for Parts 2 & 3 of College FootBlog’s 2009 BCS Conference Power Rankings later this week.